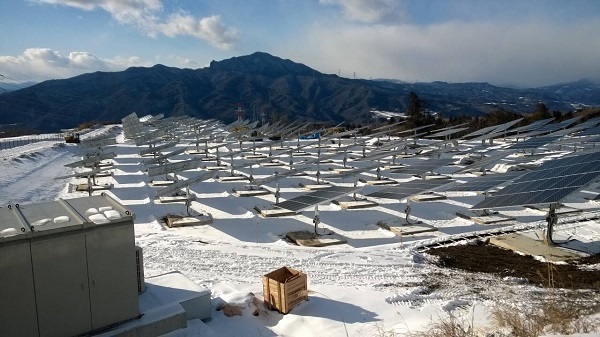 In Jan. 2018, when the strongest cold front in 48 years hit Japan, a 4.4 MW PV power plant on Mount Akagi of Gunma Prefecture kept on operating normally, amid snow 20 centimeters thick. In Yamagata Prefecture, where the snow had already reached up to 50cm thick, a similar plant was able to also continue its operations without interruption. These two plants both use the iPV Tracker from Taiwan's BIG SUN Group. Summer Luo, chairman of BIG SUN, attributes the snow-proof function of the iPV Tracker to its special design, which enables it to turn 360 degrees at sharp angle, as a result of which the edge can fluctuate between the highest and lowest level at every point, shaking off snow attached on the panel. 1. First, it can be coupled with common modules, bifacial modules, and thin-film module of any supplier. 2. Second, there are many construction methods for foundation piling, free from the confinement of space and adjustable to environment and the budget of investors. 3. Third, with sharp turning angle, the device can track the sun precisely, anywhere, anytime, and any season. 4. Fourth, backed by patents worldwide and certified by many tests, iPV Tracker boasts a structural design highly adaptable to weather, and capable of normal operation amid strong wind, big snow, and flood. In addition to the aforementioned cases in Japan, iPV Tracker has weathered numerous other ordeals, including strong typhoons in southern Taiwan in 2016 and flood resulting from melting snow in Mount Tianshan and severe sand storm in Xinjiang, China in 2017. Thanks to its reliability, a PV power station equipped iPV Tracker in Japan boasts over 50% more output than fixed-style counterpart. Thanks to high design flexibility and endurance, iPV Tracker is suited to various environments, including rooftop and tidal land. In the latter case, galvanized steel frame can be installed atop concrete piles inserted deeply into the bottom, avoiding corrosion. The device is very steady, thanks to the support of five piles and eight steel cables, capable of bearing 300 tons of weight. iPV Tracker embraces high specifications, to suit the situation of Taiwan featuring frequent natural disasters, as a result of which it has won the trust of Japanese customers, as Japan is also a nation with frequent calamities. The high specifications, though, may not be suited to places with less calamities. Therefore, in order to promote iPV Tracker in more markets, BIG SUN has decided to provide global licensing for the racking system, thereby maximizing the flexibility of the device. "iPV Tracker's core technology lies in its transmission system and electric-control equipment, including design for screw, spring, steel ring, and steel cable, as well as rotating control system. With BIG SUN providing technological guide, design experience, and standard product specifications as reference, customers can purchase, according to their own needs, modules, design racking structures, and then purchase steel materials themselves," explains Luo. With such a licensing, system suppliers can design optimal program suited to local conditions and procure local components, creating extra profits to be shared by EPC (engineering, procurement, and construction) contractors and developers. Without needing to wait shipment by BIG SUN, the development time for the system can be shortened significantly. In other words, with licensing of know-how, customer base of iPV Tracker can be expanded significantly, making it more suited to specific needs of individual markets. Years of field tests have proven that iPV Tracker can generate power for 4.6 hours daily on average in southern Taiwan, compared with 3.5 hours for fixed systems, thanks to its capability to operate normally under various extreme weathers, a testament to its reliability. To cope with the world’s other diverse environments, BIG SUN will begin to develop more adjustable iPV Trackers that can be customized to suit any user needs. This will allow it to further promote its iPV Trackers in the global market. The global PV power market will top 106 GW in scale in 2018, when the shares of regional markets and various systems will change significantly, according to the latest study of EnergyTrend. In the face of the massive and changeful market, Summer Luo believes that flexibility is the best strategy.